Developing High Performing Teams, this article explores factors that contribute to the formulation and maintenance of a high performing team in different circumstances. From factors such as ‘the changing world of teams’ to ‘team process management’ and ‘team leadership’. High Performing Teams (aka HPTs) have been a consistently top 10 leadership and management topic for the last twenty years with dozens of excellent books published on the subject. Many of today’s teams are a hybrid of two (or more) of the above which makes them even more challenging to establish and lead. Hence the need to revisit the whole HPTs topic with some more up-to-date guidance. 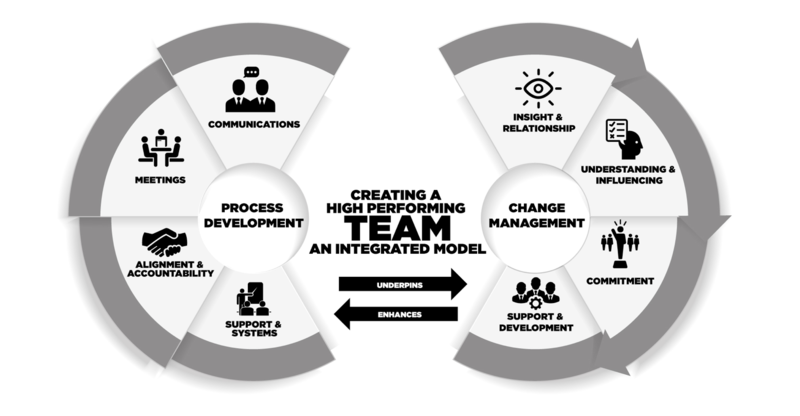 A unique aspect of this framework is that it covers and integrates both individual team member change management work and the whole team process development work. The circle in the right-hand side of the “figure of 8” model highlights the key aspects of team change management for a leader to use with the individual members of the team in sequence. Getting your team set-up, challenging though it is, is only the beginning of a team leader’s journey. There are “Seven Habits of Great Team Leaders” which can guide a team leader in the difficult transition between successful team setup and sustainable team operations. Many teams disappear down this chasm despite promising starts. Any team development should really start with a “health-check” to see which processes are the most important for the job at hand and to identify those which are totally absent or badly broken. The “one size fits all” approach to building a high performing team is seldom effective! The HPTs framework is perfect for conducting a comprehensive team health-check. You can assess the 16 elements of process to establish a) which are the most critical for your team and b) which are defective or even totally absent. You can use the 4 elements of change in conjunction with a simple team member “stakeholder” map plotting influence versus attitude to see who is a supporter of the HPTs project, who is neutral and who is hostile to it. The topics in this article are explored in more detail in Ken Thompson’s book A Systematic Guide to High Performing Teams available from Amazon in both paperback and Kindle. HIGH PERFORMING TEAMS COURSE by Ken Thompson - Topic 2 - Creating HPTs in a hurry! Ken Thompson is an expert practitioner, author and speaker on collaboration, high performing teams and game-based learning. He has given numerous talks on the subject, including a TED talk, discussing these ideas in more detail. He is Founder of Dashboard Simulations who design, license and facilitate team business simulation games for leadership and management development. Ken has published 4 books on High Performing Teams and Effective Collaboration and tweets at @kenthompson and @dashboardsims.